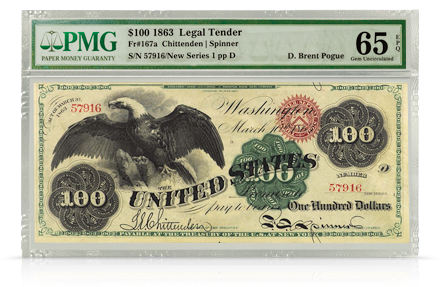 Mr. Pogue's collection is significant for its quality, rarity and scope, and includes many finest known examples, special serial numbers, "Star" notes and other extreme rarities. All of the notes have been certified by PMG. Received at the Counter in Treasury Department, this day, being the 5th demand Treasury Note issued by the United States of America for war expenses to suppress rebellion.